A study involving UCL scientists has shown that treating serious gum disease in diabetics can help lower blood sugar levels. The team behind the study, made up of Dr Terry Simpson and Dr Sarah Wild from Edinburgh University, Professor Ian Needleman from the UCL Eastman Dental Institute, Professor David Moles from Peninsula Dental School and Dr Ed Mills from the University of Ottawa, found that reducing inflammation of the gums in diabetes patients can help lower the risk of serious complications associated with the condition, such as eye problems and heart disease. The study analysed the findings of previous research into the link between diabetes and serious gum disease - known as periodontal disease. The researchers analysed the results of three of the included studies to show that there is a small but significant benefit to treating periodontal disease in diabetes patients. They say that there is a need for further research to fully understand the link between the conditions. It is thought that when bacteria infect the mouth and cause inflammation, the resulting chemical changes reduce the effectiveness of insulin and raise the levels of blood sugar. 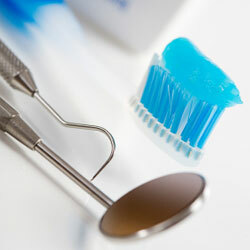 Dental treatment to reduce this inflammation may therefore help to reduce blood sugar levels in patients with diabetes. UCL's Professor Ian Needleman said: "This research is particularly timely as periodontal disease now affects at least 40% of the UK population and for people with diabetes the disease levels will be significantly higher. Furthermore, levels of diabetes in the UK are rising rapidly and with higher prevalence amongst disadvantaged groups, periodontal health is an important priority both for prevention and treatment." Dr Terry Simpson, Honorary Research Fellow at the University of Edinburgh's Dental Institute, who led the study, said: "This study confirms that there may be a link between serious gum disease and diabetes and highlights the role dentists can play in managing the condition. Furthermore, gum disease is very treatable." "By far the most important aspect of diabetes management is the use of insulin, drugs and diet to control blood sugar levels - but maintaining good dental health is something patients and healthcare professionals should also recognise. Although the benefit in terms of insulin management is small, anything we can do to promote the wellbeing of people with diabetes should be welcomed." The team says their findings, which have been published as part of the international Cochrane Collaboration, highlight the need for doctors and dentists to work together in the treatment of diabetes. The Unit of Periodontology at the UCL Eastman Dental Institute focuses on clinical and systematic review research programmes investigating oral healthcare to improve general health and quality of life. These include what is understood to be the largest clinical trial on patients with diabetes co-funded by Diabetes UK and the UCLH/UCL Comprehensive Biomedical Research Centre as well as preventing pneumonia in critically ill patients. The unit is one of the largest providers of specialist periodontal care in Europe.